Blondie and Brownie: Happy Birthday Miss Lady Brownie!!! Yay! Today's Brownie's birthday, her last sans rug-rat. Her and Lawman have decided to make it a Maine weekend, and can I really blame them? No, I can't. Just know that I'll be out buying gifts for Little B because really, baby needs them more. 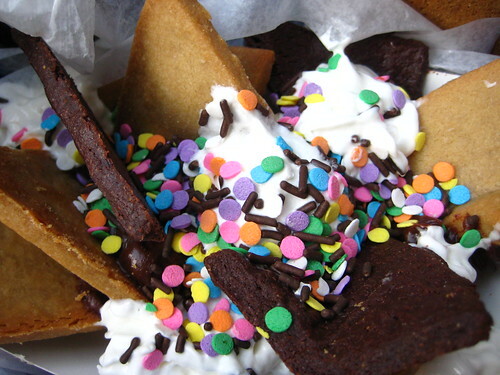 Also, those are the dessert nachos that Ginger and I scarfed down the other day, not a birthday cake photo, but JUST AS FESTIVE!! !